This original lithograph is one of four angel motifs that Marc Chagall drew for his famous first "Verve Bible". With its shining yellow, tender mauve, and deep violet, this is one of Chagall’s most subtle lithographs. 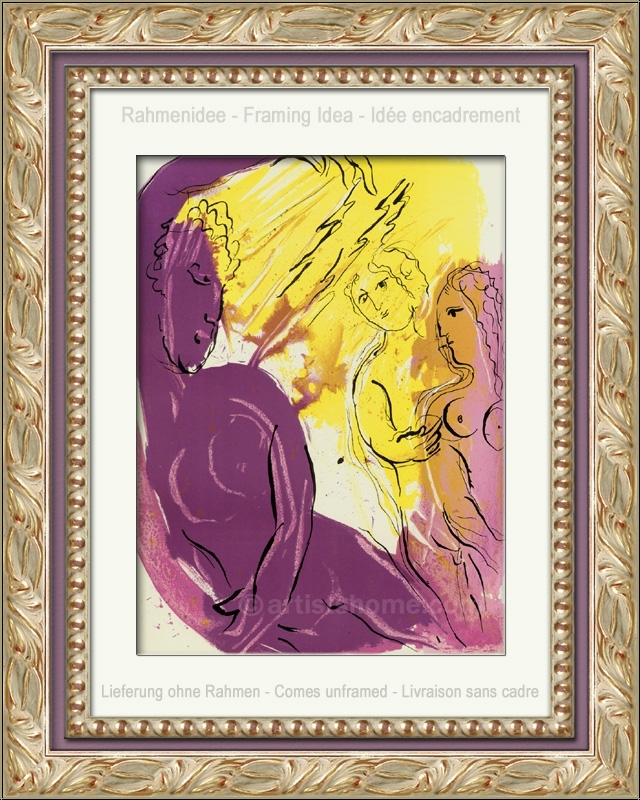 First, there is the male angel in golden yellow who seems to amuse himself "paradisiacally" between two violet female figures. The shining angel in the middle is surrounded by a violet colour circle and the inquiring women’s gazes from the left and right. The angel, clad and illuminated by a golden yellow light, seems to be in the foreground of the picture, despite his modest position in the back. The double lines that Chagall chose for the figures of this lithograph are also quite peculiar. Deep black contours seem to be repeated in a lighter hue and thus create the impression of dynamic movements. Chagall created another masterwork here by his use of simple means. The contrasting colours of the three depicted beings inevitably draw our attention towards the picture. 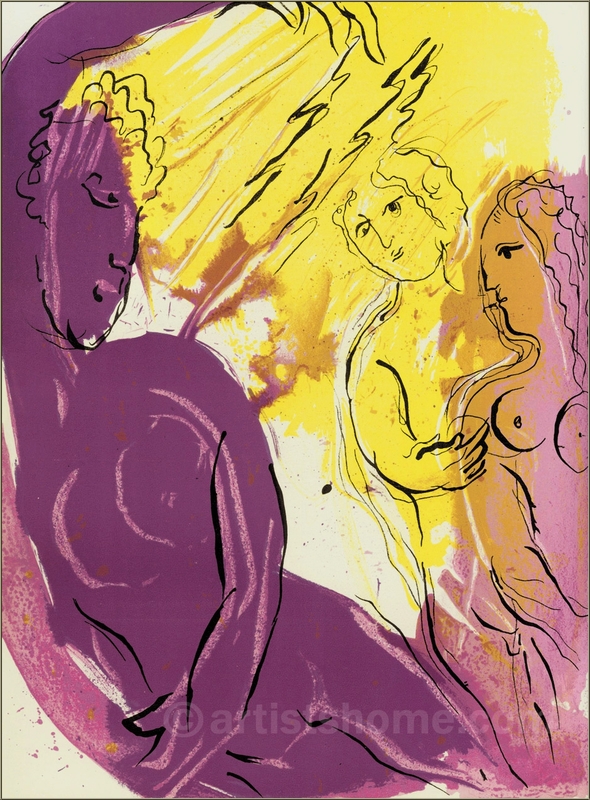 This is N O T a mass-produced reprint (offset or grano lithograph from a later "Limited edition") but the original lithograph for Chagalls "Bible I", exactly as referenced in Mourlots catalogue raisonné. One of 6,500 unsigned and unnumbered impressions on Vélin paper. In addition, 75 impressions were printed on Arches wove paper with wide margins and pencil-signed and numbered by Chagall. In 1956, the art critic and publisher Tériade brought out a special issue of the legendary art magazine Revue Verve, which was exclusively devoted to one of Marc Chagalls major themes: The Bible. For this outstanding issue, Chagall composed 18 full-page lithographs in colours and 12 in black and white. 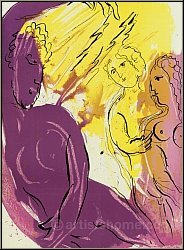 For his "Bible I" (4 years later, in 1960, the follow-up issue "Illustrations for The Bible" was published) Marc Chagall focused on characters from the Old Testament such as the Founding Fathers, the Kings, the Prophets and Angels. In very good condition, a superb impression from the archives. Frame not included in delivery.